Why do Australian parents pay $5.4billion more for education than they need to? Why are Australian parents spending an extra $5.4billion per year in school fees when socio-economic sorting across public schools would lead to the same academic outcomes? In Australia nearly a 1/3 of children attend non-government schools, however, analysis by the Australian Council for Educational Research shows that the type of school a child attends has little impact on academic outcomes. School academic outcomes are primarily driven by the socio-economic factors of the parents and the student peer group of the school. ACER’s analysis of the 2009 PISA results (Thomson et al. 2010) shows that the majority, greater than 90%, of a student’s academic results are the result of either their family background or student peer effects at a particular school. These results are consistent with the recent Grattan report ‘The myth of markets in school education’ that the choice of school type had little to no influence on academic outcomes, other than the student peer effects associated with the socio-economic composition of the school student body. If we apply the classic community optimization problem (Tiebout 1956), in a solely public school system, families in their attempt to optimize both wealth and academic outcomes will sort themselves spatially & demographically in a way that leads to optimal choice outcomes. In this way the benefits of a child’s socio-economic background will be matched with a student peer group of a similar socio-economic background in order achieve optimal academic outcomes for families. Below is a conceptual diagram of the sorting. 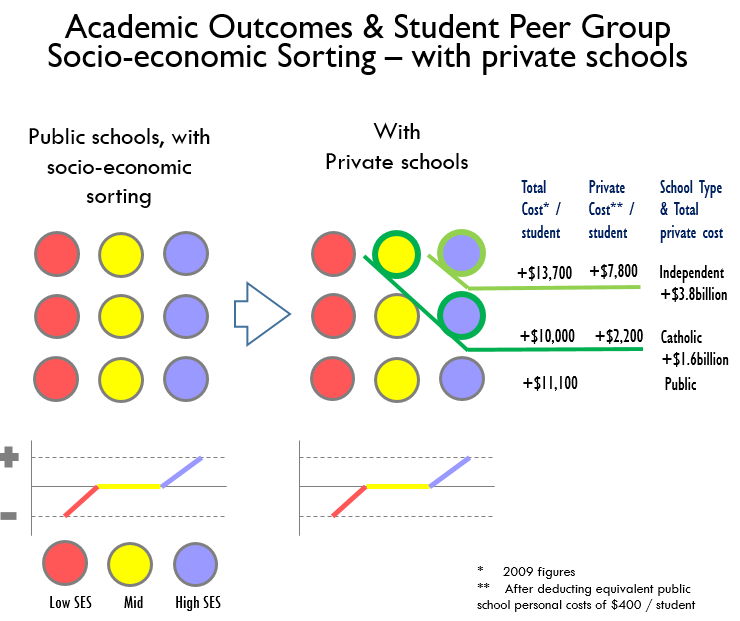 While the educational outcome maybe optimal sorting, there is no net gain for the economy as what is gained at the top is given back at the bottom. This is consistent with econometric studies in the USA (Ladd 2002). What is optimised is the wealth vs. education trade-offs for individual families. 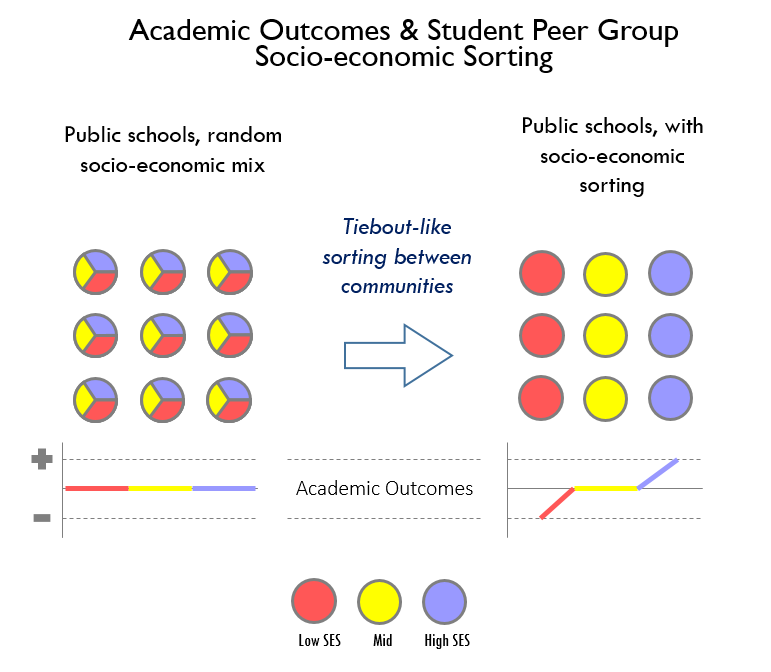 We know that this type of Tiebout-like sorting occurs naturally within an economy from econometric studies showing a correlation between residential house prices and school quality (Black 1999). In Canberra, Australia, a study done by Davidoff & Leigh (2008) indicated that for every 5% increase in school average academic achievement prices of houses nearby increased by 3.5%. Approximately 20% of school students attend Catholic schools in Australia and another 14% attend Independent schools. If academic outcomes are principally a function of socio-economic factors and not school type, why are Australian parents paying an extra $5.4billion per year (2009 figures) to choose a non-government school? Is this because school choice is driven primarily by signalling of student peer group socio-economic ‘quality’ and private schools provide better signalling of this ‘quality’? Or is school choice is driven primarily by ‘consumption’ of non-academic preferences such as teacher leadership, culture, & personal development? I hope to answer these questions by conducting an online discrete choice experiment into school choice as part of my PhD research. From waterfall Graph 5 of the Gonski report, in 2009 student school attendance by type for Australia was: Gov’t 2.3million, Catholic 0.7million, Independent 0.5million. Private/parental costs per student per type are: Gov’t $0.4k, Catholic $2.6k, Independent $8.2k Deducting the Gov’t baseline parent cost of $0.4k, $5.4billion = (700k catholic students x $2.2k) + (500k Independent students x $7.8k). Note also that these school cost figures are recurrent costs/income and for both primary & secondary schools. Capital grants are excluded, mainly because capital costs have a number of sources other than parents. It is interesting to note that the total recurrent cost of teaching a gov’t school student is $11.1k per year (2009) and that Catholic schools have a lower cost of delivery at $10k per student for what you could say is a better quality outcome. Black, S 1999 ‘Do better schools matter? Parental valuation of elementary education’, Quarterly Journal of Economics 114 (2), 577–599. Davidoff, IAN & Leigh, A 2008, ‘How Much do Public Schools Really Cost? Estimating the Relationship between House Prices and School Quality’, Economic Record 84(265): 193-206. Ladd, HF 2002, ‘School Vouchers: A Critical View’, Journal of Economic Perspectives 16(4): 3-24. Thomson, S, De Bortoli, L, Nicholas, M, Hillman, K & Buckley, S 2010 ‘Highlights from the full Australian Report: challenges for Australian education: results from PISA 2009’, Australian Council for Educational Research. Tiebout, CM 1956, ‘A pure theory of local expenditures’, The journal of political economy, 64(5), 416-424.